Two fantastic exclusive album streams are to be heard over on State and Nialler9. The band also appear on Irish Record Store Day 2012 compilation Record Store Gay, which sees a range of Irish bands record their favourite gay anthems. Stream it in full on Nialler9. I’m loving the Gaz Le Rock tune, it’s his best work yet. The album will be available to buy for a suggested donation on Record Store Day from Elastic Witch (Twisted Pepper), the RAGE, Tower Records, Spin dizzy and E2, Dame St. All proceeds will go to LGBT charity Outhouse. 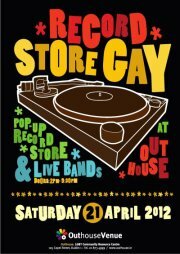 As well as the record, there will be a very special once off Pop-Up record shop and mini music festival for Record Store Day 2012 at Outhouse. Bands confirmed to date include Gaz LeRock, HelloMoon, I ♥ The Monster Hero, Drunken Boat, Lamont Bailey Wall, School Tour, Lovesea & T, Seeping into Cinemas, Soil creep, You Kiss by the Book plus more TBC.